The first group of 25 students have graduated from the Tatu City Training Academy. 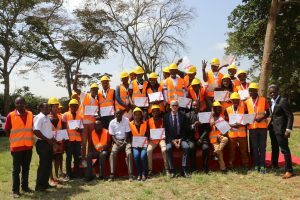 The students, drawn from local communities surrounding Tatu City, took a six-week accredited course in masonry led by training partner Arc Skills. The training academy is designed to provide vocational skills relevant to the construction industry and includes topics such as masonry, plasterwork, electrical, plumbing, painting, tiling and carpentry. On completion of each course, graduates are to be absorbed into construction jobs provided by contractors at Tatu City. Tatu City has set a standard for local content and training in Kiambu Country. All contractors working at the project are required to hire from the local community. At present, around 2,000 workers are currently on-site, hired by various contractors involved in the on-going construction work. Kaplich Barsito, speaking on behalf of Phyllis J. K. Kandie, Cabinet Secretary Labour and East African Community, endorsed the approach taken by Tatu City. “Part of our mandate as a ministry is to assess industrial training and test occupational skills, and we are glad that Tatu City is in compliance within this area,” he said. According to African Economic Outlook, statistics show that youth unemployment is estimated to be 70% and rising, with an estimated one million graduates entering the job market annually. A mismatch between skills available in the market and industry requirements is evident, and there is a lack of widespread access to quality skill development programs. Over time, the academy is expected to train hundreds of local people, with tens of thousands of employment opportunities being provided by the 5,000-acre Special Economic Zone.